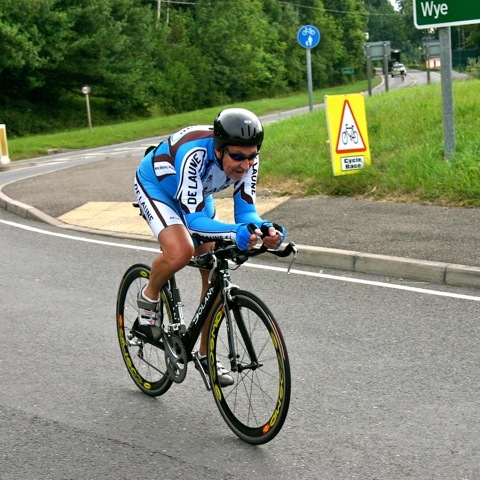 Time Trialling is a sport that is enjoyed by young and old alike. Of all the branches of cycle sport, it is probably the easiest to get into as no specialist equipment is needed. Its popularity lies in the fact that every rider can set his or her own standards and, unlike other forms of racing, nobody gets the feeling that they are being left behind. In a time trial, you may finish many minutes behind the event winner, yet have the satisfaction of recording a personal best time. Thus, time trials are unique, in that it is possible for everyone to be a winner. Start and finish points have been clearly identified with painted marks. Start on A.228 west of Grain village 14 metres north of the lamppost GFY26 on the Strood bound carriageway, by a minor access road to the National Grid site where the continuous white road edge line starts. Proceed west on A228 to turn at Fenn Corner roundabout (5.07 miles). Retrace on A.228 to finish directly opposite the lamppost GFY19 (situated on the Strood bound carriageway) (10 miles). Start at waste bin in layby on north side of A20 at Leeds Castle, west of Broomfield Road. Proceed along A20 to Charing RAB (7.456 miles) turn and retrace along A20 to finish at 23rd kerb joint from east end of layby opposite oak tree. 100 yards west of start. Start at western end of layby on A259 near to Oasis diner, adjacent to St. Clements Church sign. (TR 035251). Riders join A259 and proceed to Brenzett RAB junction of A259/A2070/B2080 (Little Chef) left to Brookland RAB. Turn and proceed via Brenzett RAB (Little Chef) (4.71 miles). Take 2nd exit onto A.2070 passing straight through Bridgefield RAB (M) to Cloverleaf RAB (13.68 miles). Turn and retrace passing straight through Bridgefield RAB (M) to Brenzett RAB, (Little Chef) (22.65 miles) where left on A.259 to finish 0.35 miles past the start, in line with the drain at the western end of layby on southside of the A259 near to Martingfield Cottage. (TR 039249). No competitor parking for vehicles at start or finish. There are ample parking facilities in the layby on the south side of A259 for the finish timekeeper. Chequered board to be placed on the north side of road to enable the riders to be aware of the finish. Alternatively there is sufficient parking on the verge on the north side of the road. Start is clearly marked. The finish point is clearly marked, in the layby, on the south side of the A259.